I’ve been recently commissioned to paint some local Kent seascapes for a couple near the Kent coastal town of Whitstable. Visible from the shore there to the west is the Isle of Sheppey in the Thames estuary. Anxious to please, I did a trio of alternative paintings, initially for myself, but took them along unframed to the buyers so they could make a choice. The one they went for is being framed as we speak, so isn't here to show, but was in a similar vein. 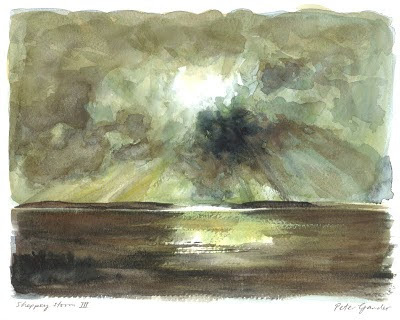 The sky is a mixture of wet-into-wet and dry techniques applied therafter. Incidentally, I always use BIG brushes. My favourite in fact is a Kolinsky blue squirrel size 26 mop! It holds water like no other and has a fine point should I be feeling in a delicate mood, which is rarely. On the paper front, it was interesting to see how differently a heavier-weight paper behaved with the water too. This is 400gsm rough and took substantially longer to dry compared to a more commonplace 300gsm paper. The benefit of that of course, is a longer working time, which can be useful. 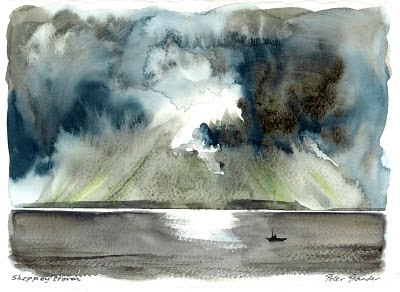 Sheppey Storm I in particular is a good example of the spreading pigments creatinga rainy effect as one colour imposes upon others in the dramatic billowing cloud effects. The rough-textured surfaceI’m very pleased with these, clouds were made for watercolours. The rough-textured surface also lends itself well to dragging a dry brush (with a little pure pigment on) across the sea or sandy foreshore, to great effect. £95 each, inc P&P (UK only). • UPDATE: Friday 6 August 2010 - SHEPPEY STORM is now SOLD. Only Sheppey Storm III remains. Email me for non-UK postage. 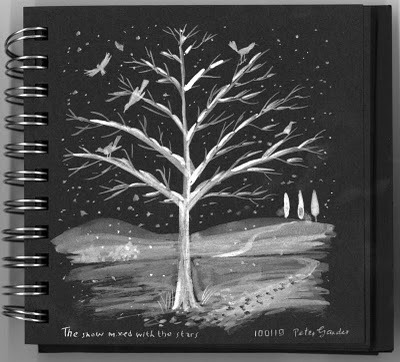 Still on the subject of arborial landscapes, I bought some white Winsor & Newton ink lunchtime from Cass arts in London’s Berwick Street. It comes in an old-fashioned trapezium-shaped bottle and sits inside a packaging design that seems to have remained unchanged since I first saw it at college when I was 17. Experimenting with stages between undiluted and very diluted, it was a joy to use the white ink on my black sketch pad, watching the pigment sink in and lighten as it dried. The result on such paper inevitably has a nocturnal feel about it, but I’m not complaining. Those birds are up late. This handmade Khadi Indian paper is very pulpy and absorbent, so tricks like the soft-edged clouds are really done justice with this paper. 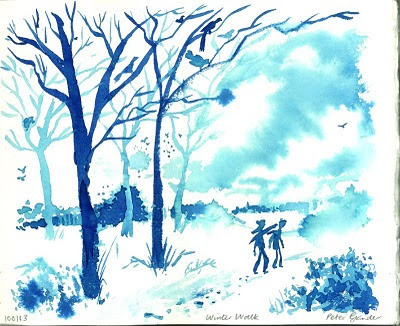 Inspired by the consitent snow we‘re having and my New Year’s walk on the 1st of January in a Kentish wood. Quink ink. 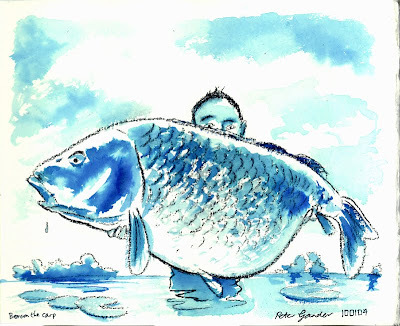 Reading the festive 'looking-back-at-the-year' Angler’s Mail over the Christmas break, I read about and was inspired to sketch Benson, a 64lb common carp, who shuffled off his watery mortal coil to much media attention during 2009. Massive carp aren’t really my bag when it comes to fishing, though I do enjoy catching carp with a fly rod in the summer. But it must be something else to catch a true whopper like Benson and credit to anyone who managed to pull in this bag of spuds! Charcoal pencil and Quink ink on Khadi Indian rough paper.